It is ironic that at this moment while I am attempting to write about the importance of quiet time with God, my 18-month-old granddaughter is having a fit because she can not exercise her newly acquired skill of climbing on chairs all by herself to reach the dining room table. At the same time, my 7-year-old is serenading the entire house at the top of her lungs from her room. While my teenager calmly slips her headphones over her ears and sinks into a music-induced coma.....sigh. Some days quiet time is a bit hard to come by. We all have "noise" in our lives. Some may have children underfoot, while others have the chatter of co-workers. You may encounter days where you are frazzled and hang from a string rather than a rope, but it is those days, especially, that it is all the more necessary to find some quiet time with God. You see, quiet time equips us to face those moments of stress that life seems to throw at us. It allows us to reconnect with our Creator, to renew our minds (Ephesians 4:23) and ensures that our will lines up with His (Psalm 143:10). Quiet time is the sip of thirst quenching water given to a parched soul. (Revelation 21:6) And yet so many of us (yep, me too at times! 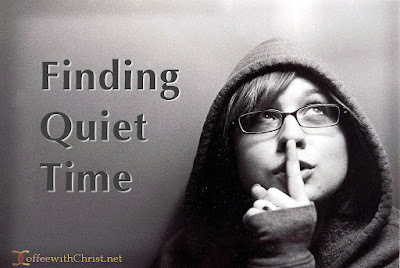 )are content to squeeze time with God into our lives, rather than make quiet time a priority. Today I challenge you to change this. Stop trying to fit Him in, and instead, put Him at the center and fit everything else in. We have a limited lifespan and every moment counts. It may mean that you lose an hour of sleep as you get up earlier to start your day with God rather than rushing out the door. It could mean that you schedule an appointment with Him on your calendar daily and don't break it. Perhaps it means you set aside a place in your home just to meet with Him. However, you chose to make time with God a priority the important thing is that you just do it. And when you do, the rest will fall into place. How do you find quiet time with God?